Last nighttime the St. Louis Cardinals beat the Boston Red Sox in game 2 of the World Series, and their triumph made Baby Marie-Antoinette less woeful than she was on Wednesday night when the Cardinals lost (which they’re not supposed to do). As with Baby Marie-Antoinette, I think the St. Louis Cardinals should win the World Series, and I also would be fine if their commendable closer, Trevor Rosenthal, wanted to be my boyfriend. But this post right here sort of tackles another topic. Before the bottom of the 7th inning, the Boston Red Sox commemorated all of the people who were blown up in the Boston Marathon. 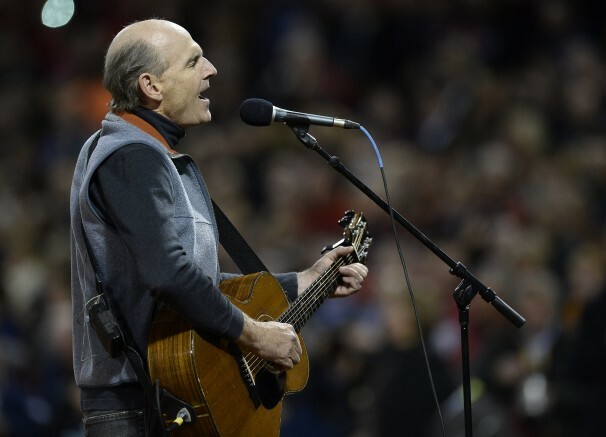 They came out onto the field, and James Taylor sang a song. This instance illustrated a theme from one of my favorite books, Frames of War by Judith Butler. In this book, Judith distinguishes between greivable lives, like the people on the Boston Red Sox’s field, and ungrievable lives, like the Muslim creatures who continue to be blown to bits. Being a boy, I like violence. But I don’t like phoniness, and it seemed to me to be really phony for all of these Boston Red Sox people to portray themselves as empathetic and moral-loaded and whatever other terms they might throw out, when, really, they’re only empathetic and moral-loaded to those who subscribe to America’s depiction of a grievable life.